Morgan’s Brew Tea Company recommends steeping Morgans Brew Tea in 98°C (208°F) water for 4 to 5 minutes. My initial steep was at 93°C (200°F) for 5 minutes. Cheeky Chai recommends steeping Ceylon Tea in 100°C (212°F) for 3 to 4 minutes. I followed the steeping instructions and steeped for 3 minutes. Pure Leaf recommends steeping Green Tea with Jasmine in 80°C (175°F) for 3 minutes. I followed the steeping instructions. Brighteas recommends steeping Bright Afternoon in 100°C (212°F) for 3 minutes. I followed the recommended steeping instructions. CHASH recommends steeping Earl Grey 1833 in 95°C (203°F) for 2-3 minutes. My initial steep was at 93°C (200°F) for 3 minutes. 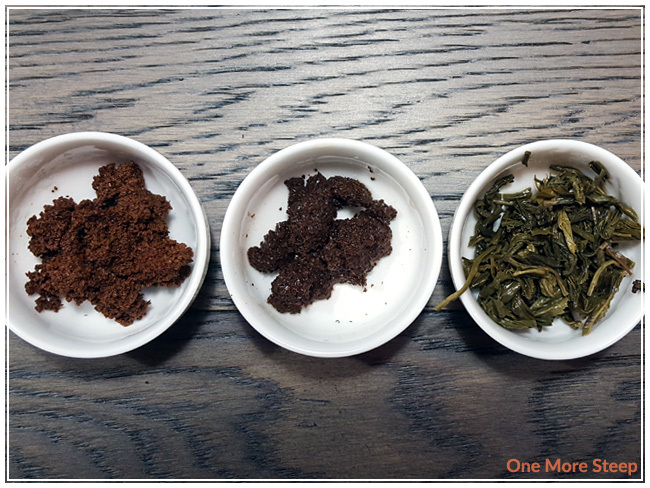 Nothing But Tea recommends steeping Safari Oolong in 80-85°C (175-185°F) for 2 minutes. I steeped at 80°C (175°F) for 2 minutes. Morgan’s Brew Tea steeps to a lovely warm reddish brown. This tea has a nice smoothness to it, zero astringency, but there’s a slight mouth-puckering quality to it. It definitely reminds me of a breakfast time in terms of the boldness of the flavour. It has a bit of pep to it, and tastes quite like many breakfast teas that I’ve had before – just with a bit more mouth pucker to it. Ceylon Tea steeps to a warm reddish brown that looks a lot like Morgan’s Brew Tea. This black tea has a light sweetness to it, and I found it to be mildly astringent. There’s some Assam-like qualities to it, in terms of the boldness, but I also found it to be smooth for most of each sip. It’s the type of black tea that I think would be really nice with the addition of milk or cream, just a touch to temper down the astringency if you’re not too fond of it. Green Tea with Jasmine steeps to a nice bright, golden yellow. I found the aroma to be mostly the jasmine, which I had expected. There’s a pleasant smoothness to this tea that’s met with a touch of bitterness at the tail end of each sip. I think this tea could probably be steeped for less than 3 minutes – I would recommend trying 90 seconds or 2 minutes to start off with, if you’re not a fan of a bit of bitterness in your green teas. Bright Afternoon steeps to a deep brown, which seems almost appropriate given the fact that the steeped tea had some nice earthy notes to it. I found the flavour of this tea to be fascinating, there was a mix of smokiness, some mushroom notes, and earthy flavours. This tea had a pleasant mouthfeel to it, with a subtle sweetness that I found at the end of each sip. Earl Grey 1833 steeps to an inviting reddish brown. I found this tea to be a mix of astringent and bitter, and the bergamot was not as present as I was anticipating after I had steeped it. I may be overly critical since I really enjoy Earl Grey blends, but I found that the bergamot flavour did not make itself well known in the steeped tea. 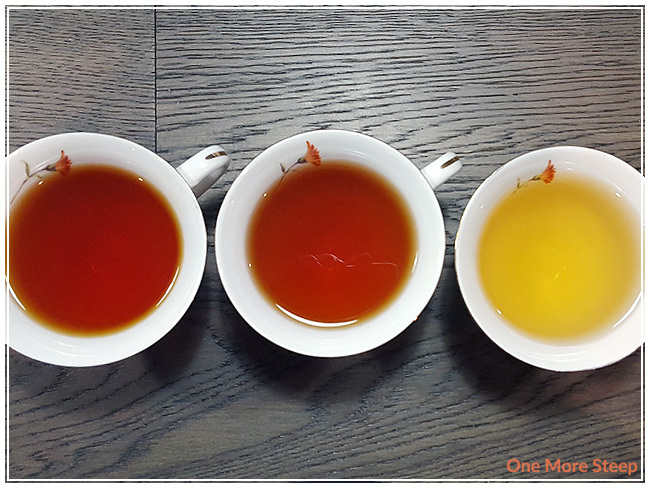 Safari Oolong steeps to a pleasant honeyed yellow. 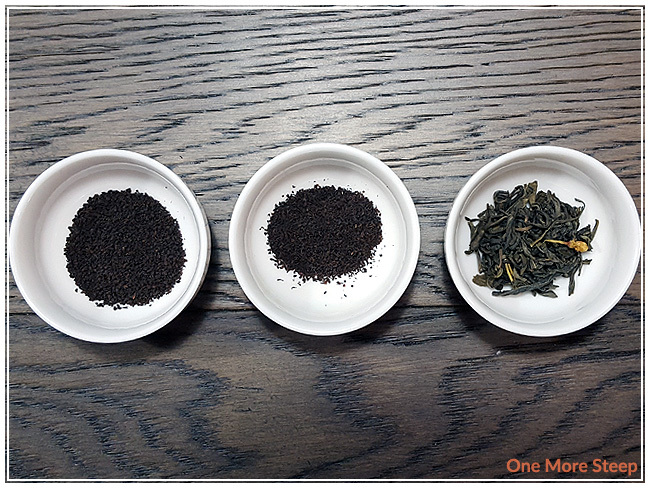 This oolong has a warming floral and sweet aroma to it. I found Safari Oolong to have some nice floral notes, with something that tastes a little fruity in the background that I can’t quite tell what it reminds me of. Overall, a pleasant oolong experience. For the first trio, I resteeped them all with varying levels of success. 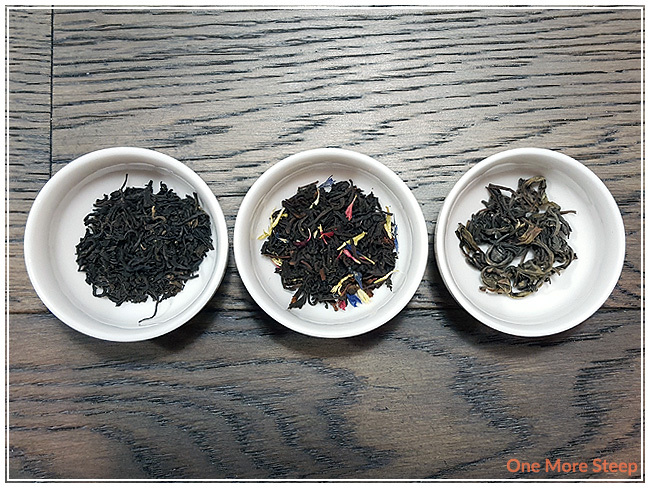 I resteeped Morgan’s Brew Tea twice and found that the first resteep was quite similar and enjoyable to the initial steep. 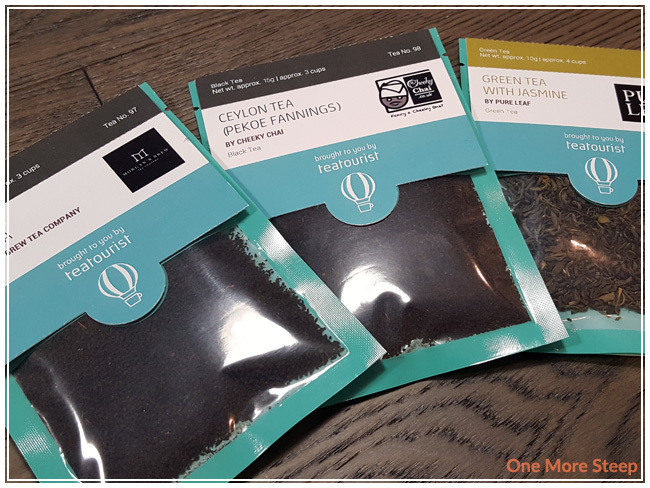 Ceylon Tea got resteeped twice, and I found it to have the same flavour and strength. I resteeped Green Tea with Jasmine three times, and found that the floral notes were deeper for the 1st and 2nd resteep, and began to lessen in flavour after that. I resteeped Bright Afternoon three times, and found that it did great. 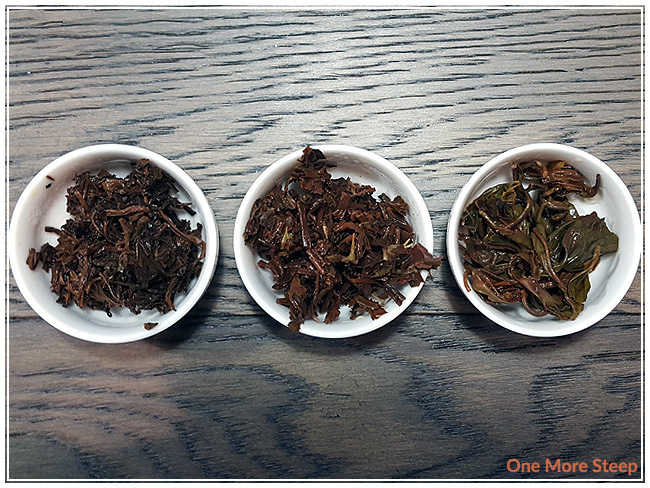 The flavour remained very similar to the initial steep. The earthy flavours remained strong. Earl Grey 1833 didn’t resteep well, it was still lacking what I was looking for in an Earl Grey blend. Safari Oolong got resteeped five times, because I like to push oolongs. I found that the colour deepened as the flavour intensified, and started to lessen in flavour around the 3rd or 4th resteep. 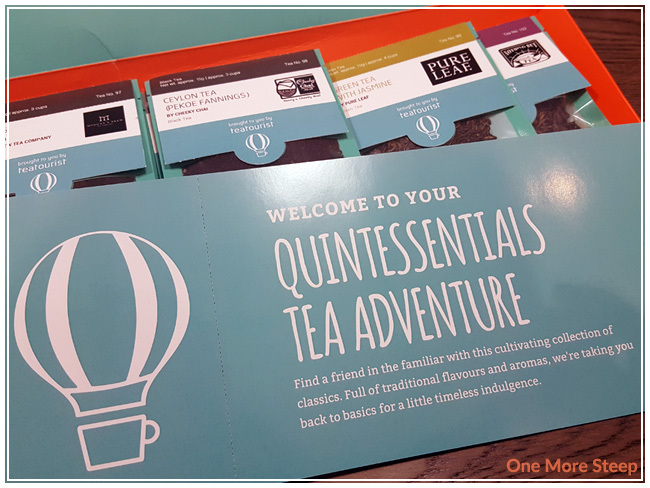 I loved Teatourist’s Quintessentials Tea Adventure. 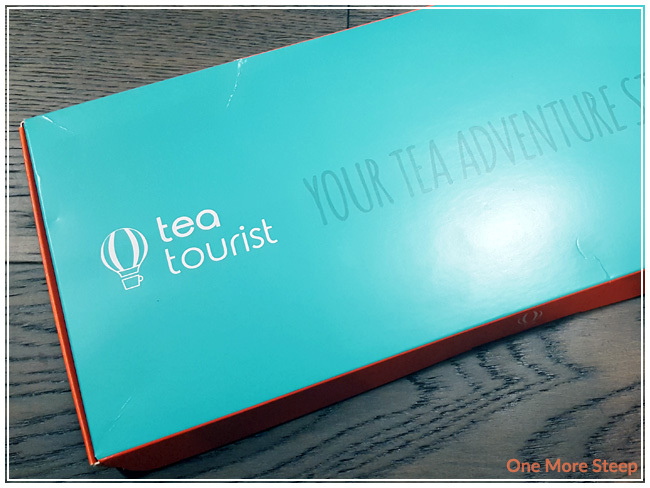 I really enjoyed having the straight teas, and this box really delivered! 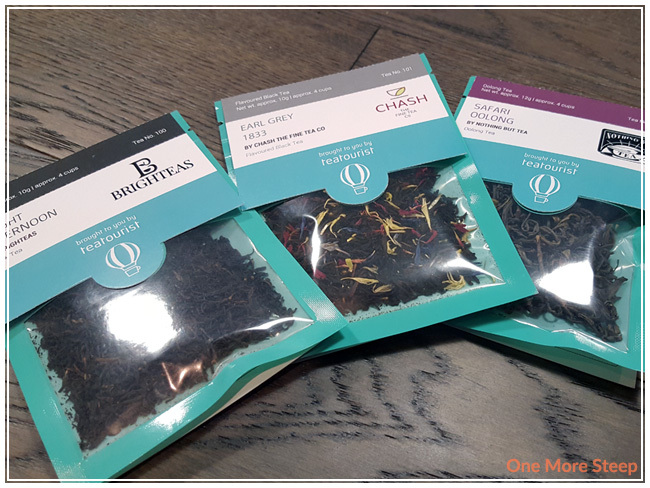 I got to try teas from brands that I didn’t have the chance to experience previously, and I really enjoyed how well they tasted and resteeped. It was really great to find an oolong in the box, since that’s one of my favourite types of tea these days. 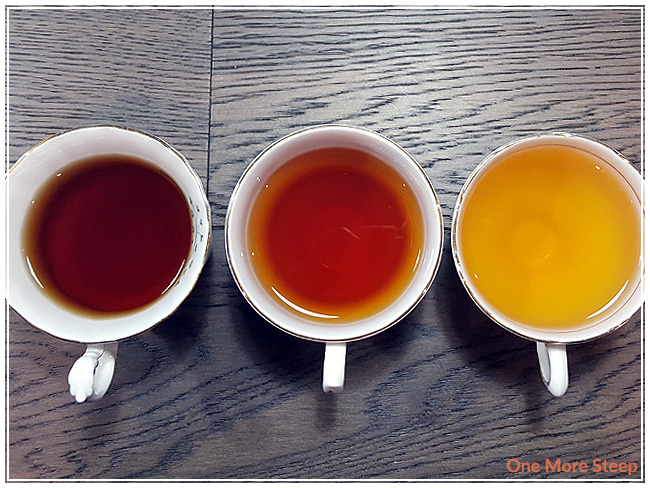 If I had to mix favourites, I would choose Green Tea with Jasmine, Bright Afternoon, and Safari Oolong.